When comparing Chinese and Western music, one must clearly distinguish which dissimilarities are genuinely dissimilar, and which are aspects in which China is lagging behind. Let me first provide a few examples of similarities. In terms of the musical scale, China has gong, shang, jue, zhi, yu (宫商角徵羽) or shang, che, gong,liu, wu (上尺工六五), and foreign countries also have do, re, mi, sol, la (temporarily disregarding other notes). With regard to meter, Chinese music has one accented beat and three unaccented beats, and foreign music also has 4/4 time. As for form, Chinese music has the parallel musical phrases jia yi jia (甲乙甲) and jia yi jia bing (甲乙甲丙), while foreign music has the parallel phrases ABA, ABAC. These are universal components shared by China and foreign countries. As for dissimilarities, China hashuayin, and although foreign music has grace notes, they are not as numerous as in Chinese music, and their usage is not the same. In Chinese vocal performance, fast and robust huayin is highly valued, whereas in foreign vocal performance, clear, accurate grace notes are preferred, producing a different flavor. This can be considered a special characteristic of Chinese music. Similarly, although the majority of Chinese music uses definite pitch, it still employs portamento much more than foreign music (the songs 4, 5, 8, 9, 11, 12, 13, and 14 in this collection all useportamento). This also can be considered a special characteristic of Chinese music. Moreover, even though the tonality of Chinese music theoretically comprises the twelve notes of the chromatic scale along with the actual seven scale degrees, for the most part the pentatonic scale is used to compose the melody. This can also be considered a special attribute of Chinese tonality (although Scottish folk songs also follow this style). In terms of instrumentation, China has the qin, which can played either by plucking or by sliding the fingers to produce legatissimo sound, and which can generate harmonics to produce sustained notes, unlike any foreign instrument. All the above can be considered national characteristics of Chinese music worth preserving and developing. Foreign music, on the other hand, can have one accented beat and three unaccented beats, or one accented beat and two unaccented beats (when there are three beats in a measure), the latter either in the straightforward rhythm of three even single beats, or in the rhythm of one single beat followed by a note with a value of two beats. There are also other rhythms, such as two single beats combined with a triplet. Foreign music uses pentatonic tonality, while also allowing for use of all twelve tones in the range of a key. In foreign music, a single song may use one key (though this is seen less frequently), or may modulate ten or more times. Foreign music also has instruments similar to the dizi (笛子) and huqin (胡琴), music ensembles of winds and strings in orchestra-like form, and organs with four manuals and one pedal keyboard. Foreign music has short songs in ABA form, longer pieces in sonata form, and simple melodies as well as polyphonic harmonies including multiple tunes in counterpoint. To call the above features differences between Chinese and Western music would be a mistake; rather, they are, quite undeniably, a result of Chinese music lagging behind. How can this be? Because the greater part of foreign music is not a product of national character, but rather a natural development of elements common to all music. Not one of the above features hasn’t already germinated in China. Even polyphony has been experimented with. But we have stopped three or four hundred years short of where they are now, and they have recently made great strides. I can only use an example to explain. When I was small, only the northern dialect was spoken in my home, but my family and teachers all used southern (Changzhou) dialect when reading aloud. Consequently, I acquired the unshakable notion that all vernacular speech should use the northern dialect, and all classical language should be read in the southern dialect. It was not until many years later that I had the opportunity to read literary works aloud in northern dialect. Originally I thought this was all wrong, and couldn’t get used to it for the longest time. So at a time when Westerners represent world music, upon hearing it one can’t help but think: “this is Western music.” Such a reaction is perfectly excusable. But a listener who undergoes training similar to my learning to read literary language in the northern dialect (which is akin to Chinese people using polyphony, the piano, and so forth) will be able to apprehend the path of Chinese music’s development. Allow me to use another simile. In the past, China was quite particular about its mathematical method, but stopped advancing after reaching more or less the level achieved by a present-day first-year college student. Later, following the influence of Jesuit missionary scholarship, foreign mathematics was gradually adopted. Nowadays in China mathematics is almost entirely monopolized by foreign-educated students. But math is math, there is no so-called Chinese or Western math, and no way to treat the use of the abacus, ancient Chinese algebra (天元) and the like any differently than calculus, functions, etc. There is only one mathematics, it’s just that Westerners’ have progressed a bit faster, such that for the time being they are the world’s math teachers, and we, for the time being, are their students. In the end, however, the study of science and art is the work of the individual (unlike the myriad complex difficulties in the emulation of societal systems). There only need be people of suitable talent–and does China lack people?–and in a very short amount of time people representing China can take to the world stage. A mathematician produced in China would be a Chinese mathematician, not an expert in “Chinese mathematics.” When discussing math, a person looking to find the possibility for developing national features in this area would find little to work with. As for music, the possibilities for developing both national features and the individuality of the musician are much greater. For example, the aforementioned huayin and portamento can be used to the greatest extent, and the use of instruments like the seven-stringed qin can be encouraged and expanded as much as possible. I am by no means a naysayer who rejects this and that out of hand. I emphasize simply that we must first study to achieve the level of world music, then add special individual or national flavor as a unique contribution. If Chinese music gets on the right track, in the future it will be like Russian music during the past several decades. Most aspects of music are common to the whole world. For example, except for the language used, the curriculum and material taught in Russian music academies is the same as that taught in Paris and Vienna; it is simply not feasible to set up a department of Russian music alongside a department of Western music. And yet Russian choruses are renowned throughout the world. They have unique features that others cannot achieve. The basic methods Russian composers use to compose are common to all world music, but the listener can hear and enjoy the Russian national features and the individual character of the composer residing therein. This is precisely the sort of thing that Chinese music should aim for in its development. Although a great many aspects of the Chinese musical system haven’t caught up to that of foreign countries, the key issue is harmony. Modulation is only possible within the medium of harmonic variation. Only when a key makes use of all twelve notes of the chromatic scale does it have significance. Without harmony, not only does the music as a whole lack harmonic interest, but even single notes lack room for development. Monophonic music only has the freedom to make changes in one dimension. Like a narrow ribbon colored red and green in alternation, infinite variations are possible, but only in a horizontal direction. Compressing a rainbow pattern lengthwise along a meter-long ribbon only a half-inch wide ribbon would be a bit unpleasant, don’t you think? (According to this simile, of course, the ribbon could not have different colors distributed across its width.) Having different melodies progress simultaneously, however, provides the freedom to create variations in two dimensions, so that you now have a spacious horizontal landscape scroll that can be extended as long as one wants to provide infinite interest. To make another math reference, compared to the endless variations available in two dimensions, the endless variations of one dimension are naturally “-less” to the point of nil! Even beginning harmony students know to avoid using this kind of parallel fifths (E to B, C# to F#), but in music with a special added flavor, there’s no harm in playing around with them. In song number 14, “Maiden” (女郎) on page 31, the phrase “a slender form is spinning” (旋转着一个苗条的身影), the melody is . . . These are almost entirely parallel fifths, but I think the method of matching the line . . .
. . . with . . .
can be thought of as a perfectly conventionalized Chinese harmony. This, along with several other things I’m playing around with, are not absolutely new inventions. Debussy also did some experimentation with pentatonic tonality. I use a bass line like V, VI, I to replace the V, I cadence, which Borodin also used, though I can’t remember in which piece. Today such things can be considered just a frequently used embellishment. With regard to tune, opportunities for mixing in a Chinese flavor are even greater. In many places I’ve used speech-like portamento or Chinese methods of singing (indicated in the music by a slanted line), and there are some places in which I have used huayin (花音) especially frequently. In terms of the selection of material, the melody of “Listening to the Rain” (听雨) adopts the tonality of one of our Changzhou ancient poetry chants, though in an extended version. With the four seven-character lines of “Vase of Flowers” (瓶花), I took the broad liberty of writing out tonal progression according to a formalized version of how the poem would be chanted. The four repetitions “Teach Me How to Forget Her” rather resemble the final line of the introduction Peking opera xipi (西皮). As for portions of “Cloth-Selling Song” (卖布谣) and “Weaving Song” (织布), the middle sections of “Labor Song” and “Climbing the Mountain” (上山), the remaining portions of “Teach Me how to Forget Him,” and the “maiden’s” solo part of “Sea Rhyme” (海韵), while I didn’t borrow from any particular melodies, these constitute a manifestly Chinese school of tonality because all are based on the pentatonic scale. I anticipate that people will say that these parts sound the best. The remaining parts belong to the Western school of tonality, and you’ll just have to put up with them for the time being. If you wait a bit, the good-sounding stuff will come along as a reward for your endurance. This sort of attitude toward listening to music is not unique to China. Foreigners who don’t understand music also often separate longer pieces into good and bad parts. As everyone knows, without the contrasting relationship to those “bad-sounding parts,” the “good-sounding parts” wouldn’t sound as good. I’ve had the same experience, so I might as well tell readers about it. With some exceptions, the sequencing of songs in this collection is by date of composition. To be specific, the order of composition is: “Crossing the Indian Ocean” (过印度洋), “Her” (他), “Autumn Bell” (秋钟), “Labor Song,” “Short Poem” (小诗), “Cloth-Selling Song” (1922); “Weaving Song” (1925); “Climbing the Mountain,” “Teach Me How to Forget Her,” “Drinking Song from La Dame aux Camélias” (茶花女饮酒歌), “Also a Faint Cloud” (也是微云) (1926); “Sea Rhyme,” “Listening to the Rain,” and “Vase of Flowers,” (1927). The first three are completely in the style of the Western school (that is, the universal school, meaning that foreigners can’t tell the nationality of a composer from the music), but the further into the collection, the more Sinified the songs become. By the second song from the end, I use modified versions of the tunes of ancient poetry chants, and in the final song I simply adopt the tonal shape of the seven-character poetic line. Although I’m committing heresy by saying that China doesn’t have music and that Western music is world music, readers can trust that in practice I can’t help but move gradually towards Sinification. I have also undertaken a bit of an experiment in terms of the relationship between the spoken pronunciation of a character and its musical intonation. In foreign languages that don’t have the four tones found in Chinese, words can be sung however you want. There is only one strict condition: the stress accents of the words must coincide with the stress accents of the music. Of course, in Chinese music one must also pay attention to stress accents, but there is no need to be as strict as in foreign music. But if the characters’ four tones don’t properly correspond to the music, they will inevitably be smothered by the melody when the piece is sung. There is the danger that an audience will find it difficult to understand, or if they do understand, they will think that the piece sounds unnatural. For example, in the past I heard people sing “When Will the Chinese Rise Up” (何日醒) , wherein the second line “Evil vapors and opium invade” (妖烟鸦片进) was sung on the melody sol sol sol la sol. The last character was sung on sol while the one before it was sung a step higher on la, so I heard the line as “Evil vapors and opium are refined” (妖烟鸦片精) (at that time I didn’t know the difference between the -n and -ng in jin 进 and jing 精). This is why Chinese music has definite rules for setting words to a tune. You must not only consider the four tones, but also the voiced and unvoiced sounds of initial consonants. But there are two ways to go about making these kinds of rules. One is the strict method; that is, to sing the four tones as you encounter them, perhaps choosing from a restricted number of options. But if you do that the music gets stifled–there is simply no room for creating a melody–and you still end up just chanting a poem, not singing a song. That’s why there’s so little variation in the thousands of pieces in the traditional repertoire of Chinese songs–at least in the eyes of the rest of the world there is too little variety. Aside from not using accidentals and not having enough modulations, this method of composition has also been limited by too much strict regulation. If you only use a kind of loose rule–which is really no rule at all–you only need to adhere to the most general range, within which there are still unlimited possibilities for variation, so that one can maintain the original tones of the characters and compose freely. When it comes to defining the loose approach, there are two schools of thought: one uses the four main tones in Mandarin pronunciation to determine the rise and fall of melodic range. The other is the traditional model for dividing characters according to level and oblique tones. Level-toned characters always tend toward low, even notes. Oblique tones are always inclined toward high notes or places in which one word is sung over several notes. This kind of singing actually coincides with the spoken parts in old songs, plays, and operas. For example, the two characters “nü lang” (女郎) are third tone and second tone, so according to the first method of transcribing a melody, one could write something like this . . .
Perhaps because I’m a bit conservative, of these two methods I think the second is a little more subdued and elegant, so all of the melodies in this volume adhere more to this school of thought, although admittedly my melody and modulation are strictly wedded to a “Chinese” tonality. The two methods aren’t mutually exclusive, however. There are many places where I’ve set the principal music according to the old school of thought, but at the same time allowed for a bit of quick huayin to be added before a word so that the tonality of the Chinese character can be “spoken.” Even if huayin is not explicitly included in the musical score; the singer can add a little ornamentation so that the word is pronounced more clearly. For example, the melody of “Weaving Five Zhang of Cloth in the Morning” (朝织丈五) is set according to the second method . . .
1. Level-toned characters use level notes; do, mi, or sol are appropriate, but not always necessary. If changing notes on a single word, starting with a high note and moving to a lower one is suitable, with the exception of huayin. 2. Oblique-toned words can transition across several notes from the beginning to end of one word; they can, but don’t have to, use re, fa, la, or ti. 3. When level and oblique tones are adjacent, the level-toned word should be at a lower pitch and the oblique should be higher (that way, the oblique tone need not either transition across more than one note, or be sung on re, fa, la, orti). 4. The aforementioned three rules only apply to the important words in a phrase, especially if they’re rhyming words. The others can be completely unregulated. 5. The aforementioned four rules are only fit for use with ordinary tunes. But with realist or comedic songs, there is no harm in using the two methods concurrently or just using the method of the first school. I’ve explained these several principles quite loosely, perhaps even to the point of ambiguity. But there’s no other way to do it because otherwise, if regulations are too strict, there is no room left for freedom of composition. Now that this first volume of the New Poetry Songbook has appeared, I expect that Chinese people will still think it’s foreign music and, as mentioned above, I admit the same. Will foreigners consider it Chinese music? No, they’ll also think it’s mostly standard music, but with a little Chinese flavor here and there. According to those foreigners, real Chinese music must use harmony comprised entirely of parallel fourths, fifths, minor sevenths, along with other such eccentricities. They’ll even dislike that I’ve used the Europeanized fa and ti. Little do they know that one can find such things all over in traditional Chinese opera, but because of their ignorance, they’re surprised. At the same time, the so-called “Chinese music” they put together simply tosses in a bit of Chinese material. They’ll branch out to South Africa or Australia–anything to avoid the suspicion of being Europeanized. If it’s not European music, well then it must be “Oriental”! The source of such error has to do with the idea of “museum China.” Not just with music, but with many other things, too, they invariably perceive China as if we still wear Manchu braids, support an emperor, chant loudly while shouldering water and carrying sedan chairs, and chant poetry and Buddhist sutras. That way their tourism companies still have subject matter for their advertisements. That way they can use adjectives like picturesque and quaint to describe what they see when they travel. Most of those people are interested in Chinese music for its novelty, so the more different and strange it sounds, the more they like it. But if you really love something, you have to be able to put up with it for a lifetime. Can you live with it? To simply call itquaint won’t do; don’t you truly think it’s lovely? Isn’t it cozy? Don’t you find it moving? When you live comfortably with running water, electric lights, and pianos all year round, encountering a less refined place and hearing less refined music naturally piques your interest. But we Chinese people have to live out our everyday lives in China; not everyone in the whole country can wear Museum of Ethnography clothing our whole lives just in case you happen to drop by. China isn’t San Francisco’s Chinatown, and it’s not an Indian reservation. So now I present a challenge: If a European or American claims to like Oriental music, give him a book of so-called unadulterated Oriental music alongside this songbook, then tell him that for a few months, whenever he’s bored and wants to while away the time with music, he may only listen to or sing pieces from one of the two. Then ask him which he would choose. From his answer, you’ll see that it is unreasonable for others not to approve of the kind of harmonies and scales I propose. Translator’s note: An ornamented, improvisatory style of playing or singing characteristic of traditional Chinese music. Translator’s note: A technique of singing or playing in which the performer slides from tone to tone with continuous sound as opposed to moving from definite pitch to definite pitch. See Li Ji’s (李济) article researching the qin score for You Lan (幽兰), in Qinghua Journal (清华学报), vol. 2, no. 2 (1925): 573-578. Translatior’s note: An early 20th century patriotic song. 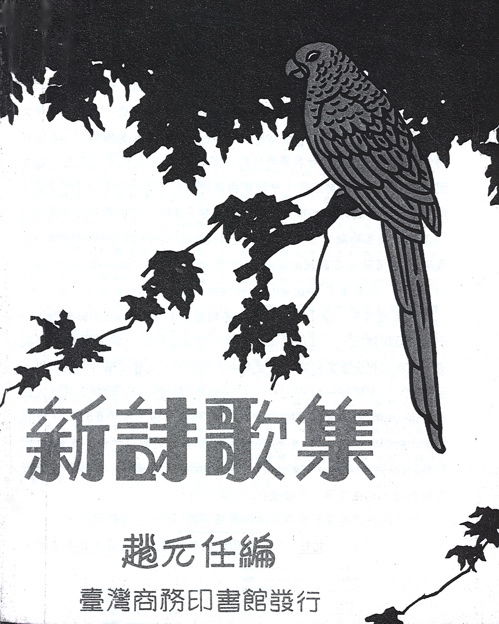 See books like Leisurely Talks on the Songs of Gu (顾曲麈谈). Translator’s note: The author here refers to the Qupu (曲谱), a fourteen-volume collection of Qing dynasty songs, as constituting the entire repertoire of traditional Chinese song. The oblique tone is not used in the sound system of the Chinese national language. See the essay in this volume “The Pronunciation of Song Lyrics” (歌词读音) . Translator’s note: Italicization indicates words and phrases originally printed in English.